You'll also be able to show or hide specific elements. We'll be talking about the basics of creating quotes. For more advanced options see the individual articles linked above. To get started head to the Block menu from your Qwilr Page. Choose Quote. 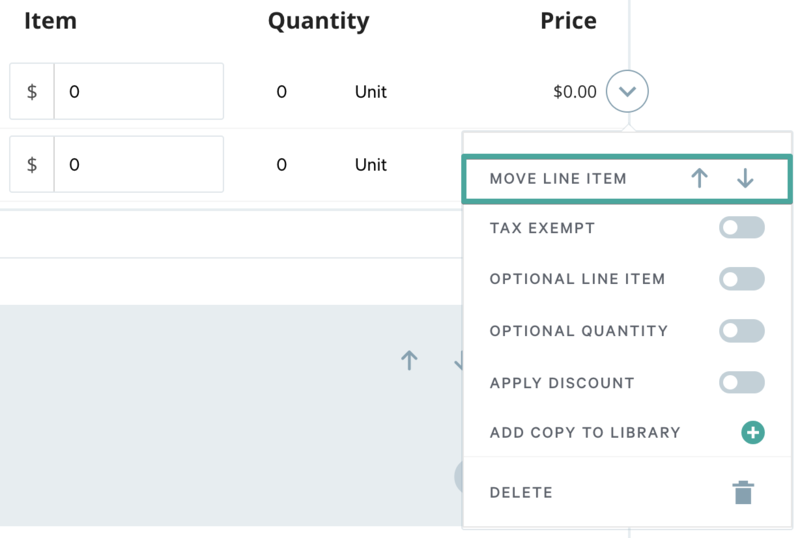 You should have a blank Quote waiting for you to add items and sections. You'll always start off with 1 blank section and 1 blank fixed cost item. If you want to add a new section you'll click on the ✚ in the spot you want your section to appear. This means to insert a section in between 2 other sections, you'll click on the + wherever you want that section to be added. To delete your entire section click on the trash can icon in the top right corner of the quote section. You'll see it turn red when you hover over it. To add a line item, you can click on the ✚ icon in the bottom left corner of the section. Or, if you'd like to add a line in between already added lines, you'll want to move your mouse to the spot needed. Once you hover over it, you'll see a ✚ icon pop up. Click on that and choose your item type. If you want to move the item afterwards, open up the line item settings and use the 'up' and 'down' arrows. You can save a new item directly from your quote block. Click on the item settings option and choose Add copy to library. To use a saved item or to access your library, click on the Saved Item option when adding a new item. From there you'll be taken to your saved item library. Click on the item you want to insert into your quote. To delete from your library, again head to the Saved Items option and then when you hover over the name of an item a trash can will pop up. To delete a line item just from your quote, head to the item settings menu and choose Delete. Within your quote block you can hide certain elements so they're not visible. Within each section, you'll be able to hide rate and cost details. To do this, click on the settings icon in the top right corner of the section and toggle off the Show rate details and/or Show cost details option. Important: The total of the quote will stay the same even if the rate and/or cost details are hidden. To hide (or show) Quote total and Section IDs, head to the Quote block settings menu in the top left corner of the block and hit Display options. From there you will be able to toggle on/off the Quote total and Section IDs options. If you have a discount or tax applied, you can choose to show it in your quote total or hide it. You can do it from the quote total section underneath the quote.